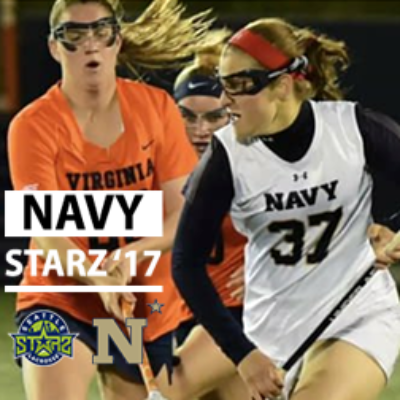 Starz ’17 alum Nicole Victory and her Midshipmen teammates recently finished a stellar 2018 campaign. Navy won the Patriot League Conference title and made it to the quarterfinals of the NCAA Women’s D1 tournament before losing a 2 goal thriller to Maryland. Victory scored a point in each of the final 6 games in her rookie season. Describe what playing in the NCAA tournament was like. Playing in the NCAA tournament was like a dream come true for me. I grew up always watching the tournament games and I never would have guessed I would get the amazing opportunity to play myself. Being a part of post season play was so exciting. I had the chance to play with and against some of the best players in the country, and that is truly an amazing feeling, and builds your confidence each time you step on the field. The level of competition was unparalleled to anything I have ever experienced and I can only hope to get the chance again in the next few years. How did playing for Seattle Starz help you have a successful freshman season? I can honestly say that I would not be the player I am today without Seattle Starz. Coming to the east coast to play lacrosse was definitely nerve-wracking, but I was more prepared than I thought because of all of the tournaments Seattle Starz played in every year on the east coast. Along with that, the coaching staff was amazing and always willing to help you improve your game whenever you had questions or needed help. For me, the biggest difference between high school and college lacrosse was the overall speed of the game. Every aspect of the game seems to move about 10 times faster, which makes it more exciting to play and watch. What is the best piece of advice you have received from a coach? The best piece of advice that I have ever received from a coach is to not be afraid to make a mistake. The best way to learn and become a better player is to make mistakes, and since everyone makes them, it is better to embrace them. If you make a mistake, don’t think about why it happened, just learn from it so it won’t happen again. What made the Naval Academy the right school and program for you? It was just the right “fit” for me. After my first visit after freshman year in high school, I just had that feeling that Navy was the place for me. This school requires intense focus, dedication, and juggling many things at once (rigorous academics, daily military trainings, lacrosse, etc…. ), and my personality is suited to this environment. I also wanted to be a part of something bigger than myself, so the Naval Academy was always my top choice. The unparalleled education and endless opportunities the Academy provides during and after your four years is unbelievable and I couldn’t imagine myself anywhere else. I knew Navy was the right lacrosse program for me in the beginning mostly because of how large our team is. We have one of the largest teams in the country, which provides opportunities for competition as well as creating lasting friendships. What has been the hardest part of balancing being an athlete, a student and a midshipman? The hardest part of balancing everything is finding enough time to do everything to the best of my ability. There are always times at practice where I think about school and vice versa, but I have to force myself to be in the moment and just focus on what I am doing at that time. We always have so much going on at the same time, so it is difficult to choose what to focus on. I have just had to learn to compartmentalize, and whatever I’m doing at any given moment, I give that my 100% attention and effort. One piece of advice I would give to younger players is to just play free. Lacrosse is a sport that we all love so just have fun with it and don’t let anything else get in the way. Be confident in the abilities you know that you have and go from there. What part of your game do you believe improved the most this season? Probably my stick skills. I had to learn to become a lot faster with the movement of my stick if I did not want to lose the ball. The defenders are much better than in high school, so you are forced to improve your stick skills in order to control the ball. Question from previous Alumni Spotlight: What is your favorite part about college lacrosse? My favorite part about college lacrosse is definitely the friendships that you make on your team. The team spends so much time together, on and off the field, and you create bonds that will last long after you graduate. Question for next Alumni spotlight? What do you miss most about high school lacrosse?